Thank you very much Benoît for your prompt response. it worked great. Thank you again Michael for this great theme. i’ve just installed this theme and i can’t get photoblog to work (have lightbox) – clicking on photoblog tag works like a regular tag.. how do u fix it? Hello, I have some problems with photoblog: although I selected in options to use thumbnails, when I click on “photoblog” tag it shows just the latest post. No thumbnails of others posts tagged “photoblog” and it can’t show the widget, placed in the right sidebar. Seems like it can’t load anything. Great theme. Started a new project with it. thanks again man. Thanks for this great theme that i’m using on my personal blog. How can I put on my blog a link like “loopy”? Is planned? So you just change the link, and the text, copy your image into the ‘elegant-grunge’ folder (or anywhere, as long as you adjust the link appropriately), and update both references to loopy.png in the css above, as well as adjusting the width and height properties. I’m wondering how to avoid the large white/shaded frame around images that have no classification of style. I’ve read and re-read the FAQs and the suggestions do not help … any other ideas? Elegant Grunge determines whether to frame images by looking at the image sizes. Sociable doesn’t add dimensions to its image tags, so Elegant Grunge doesn’t know how large the images are. However, we can ignore these by identifying their class name. The same applies to your Feedburner links; in this case, there’s no class name on the image, so you’ll need to edit the plugin (Feedflare?) and add a class to the images. You may need to seek assistance in the WP forums if it is required. I am trying to use a danish language file but it does not seem to work. I have chosen da_DK in my config file and I have tried to place the files in the elegant grunge folder but it does not seem to work. What am I doing wrong? Mike, For some reason Im having problems with internet explorer, where its not fully loading when there is a post with an image incorporated. Firefox and opera have no problems fully loading. I have come to this conclusion about the image in that when i remove the post with the image everything loads fine in Internet Explorer. Is this a problem that has been approached? Thanks! Hi, Nick; please excuse the delay in getting back to you. I haven’t had prior reports of this one. Could you post a URL where this is happening? but, I have a problem when I use window live writer. When i publish something(text or photo), it wouldnt show up like what I write. And the photo wouldnt show up as well. it’s only look like html code. U can check it on my blog : http://www.sketchoflife.co.cc what should i do to fix this?? I’ve specified an image for the header in the theme settings, but the image displays centered in the header area. Is there a way to have it left-aligned (like the menu above and the content below)? Never mind…I ended up just pasting my graphic into the header.jpg graphic. Please excuse the delay; your solution works, but other possible solutions include expanding your png to the width of the header, so the actual content sits in the right place, or by editing style.css. Any suggestions as to why my index page doesn’t appear properly? individual pages are fine. Hard to say, Ryan; I suggest you do some isolation testing, open each post individually in turn until the problem appears. Sorry about the delay, Steph. The most recent entry of the photoblog shows as a normal post; subsequent entries appear as just their images. See my photoblog for an example. You have only one photoblog entry, so it appears as a normal post. An appropriate representation of the requested resource /caco/wp-comments-post.php could not be found on this server. I get similar errors when I click on the Home or About buttons in the header and link in the sidebar. I only get these errors from the individual page for the newest blog entry. All of these work properly if I go into an older entry. Nevermind… My problem isn’t with your theme, it’s with the permissions on my server. I think I need to contact my server’s admin. I am liking your theme, btw. It’ll be great once I iron this wrinkle out. hmm.. photoblog page still only displays the first latest entry and widget still doesn’t work. it doesn’t say in your faq, but do photoblog-tagged entries need to be image only, no text? Hi Steph – Ahh yes, that’s definitely a problem! Without seeing your WP/Elegant Grunge configuration, and your backend configuration, I can’t be sure what the issue is; one possibility is that there’s an issue with your PHP installation that’s preventing the detection of images. Look for a PHP error log wherever your host puts it – on mine, the error log appears in my webroot if there’s a problem. Failing that, backup the functions.php that’s currently in the elegant-grunge folder and replace it with this debug version of functions.php (It’s a zip file, extract it first); then reload and see what it says. hey mike.. first of all thanks for your time. i really appreciate it! 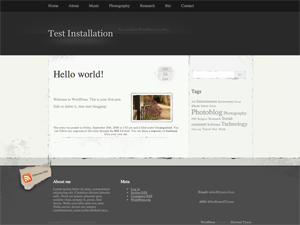 have renamed tag-photoblog.php and the other posts appear like you expected. disabled scaled thumbs, but nothing happens. there aren’t any errors associated with elegant grunge either, the ones in the log appear to be for my prev theme. am running php v5.2.6 if that’s any help. lastly.. am unable to download the debug version of functions.php, i think it didn’t upload as a zip. it sort of works now. but where images are supposed to appear it says “Successfully identified image in post” :) progress!! Hi again, I am using the theme and my friend loves it, I am just running into one issue in safari. the footer is off center. has anyone else run into this? I can’t seem to figure this one out. the site is: http://www.endyouranger.com thanks for any pointers. Hi Michael! Great theme, great job, thank you! I just wanted to stop by and say a ‘big’ thank you to you. I downloaded your template, Elegant Grunge, and have to say I love it. Also, if I can ask you, how do you incorporate your photos? I see you have thumbnails in you sidebar. Would love to know how to do that, however, I understand if you are busy. I just wanted to thank you for a theme that was really easy and enjoyable to work with! i was (still am) a newbie at WP and was sorta “scared”, but really didn’t run into any problems that i couldn’t figure out. what we’ve done finally went live today and pretty excited about it.